Topo-Grabber is a program that allows you to download USGS Topographic maps of the United States, including the lower 48-states, Alaska and Hawaii. These maps are full-resolution USGS topographic maps that are exactly the same as the paper maps you would buy from the government. All maps are completely free of cost. You can also download high resolution Black and White aerial photographs of the entire Unites States with resolutions down to 1 meter/pixels. Full color aerial photographs with resolutions down 1/4 meter/pixel are available for certain areas in and around some large towns and major cities. Update and Good News: Although Microsoft announced in 2012 that it was discontinuing their Map Server that Topo-Grabber used to get its topo maps, so many people complained that they relented. As of June, 2014, the server is working as well as ever and might even more responsive than before. I have noticed occasional service outages and at times, the server is slow, but it is usually responsive in if you wait a half hour. Since the service continues to be available, the program has been upgraded with several new features. 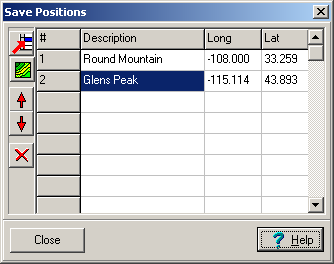 For example, the program loads the topo maps faster and uses less system resources. 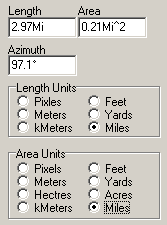 There is also the option to display 7.5, 15, 30 minute and 1 degree grids lines. 1. Simple Mouse Zoom and Positioning. The program allows you to drag the map into position by dragging it with the mouse. You can center and zoom on a location in the map by double clicking. 2. Resolution. There are a total of 12 different resolutions. These include the standard USGS resolutions that correspond to 30-minute, 15-minute and 7.5 minute quadrangles. There are also intermediate resolutions plus super high resolutions down to as little as 1/4 meters per pixel for some aerial photographs. 3. Map Size. The maps can be any size ranging from a 0.25 x 0.25 mile patch to maps covering hundreds of miles. Maps can also be zoomed and magnified to focus on specific areas or to make it easier to see more detail. 4. Printing. The maps can be printed on any color printer. The prints can be single sheets or multi-sheet allowing very large maps to be pieced together. You can print very large maps and create seamless maps that covering an area much larger than a typical paper map. A "print-preview" option allows you to see exactly how your maps will look, even if they are spread over dozens of sheet of paper. 5. Google Earth Overlays. The Topographic maps can be exported as Google Earth KMZ files to be overlain on the Google Earth Globe. This can be very useful because Google Earth doesn't always have all the terrain details, surface features and place names that a USGS topographic maps does. 6. Move To Google Earth Location. If you find a location in your map that you want to examine in more detail, you can press a button and Topo Grabber will automatically open Google Earth and zoom on the same location you are viewing in the topographic map. 7. Measurement Tools. You can measure distances, angles and area on topographic maps and aerial photos. 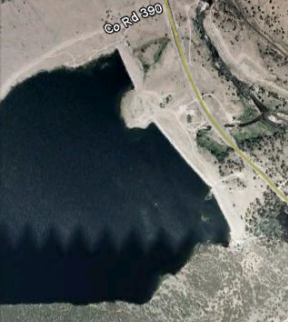 For example, in the image above, we have measure the perimeter and area of small reservoir in Denver Colorado. 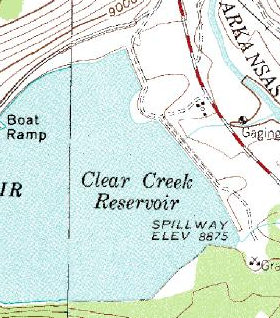 The distance around the lake is 2.9 miles and the area 0.21 square miles. You have choice of units including Acres, Feet, Meters and Miles. 8. Saved Positions. You can save map locations for later recall. Each saved position retains the location, map resolution and the type of map. This makes it easy to recall locations and maps that would ordinarily takes several minutes to find. The image to the right illustrates the operation of the Save Positions feature. It shows two saved positions, one in Montana and the other in New Mexico. To retrieve the save position, you just double click on the item.